my trip to Munnar had been cancelled due to floods, so on quick change of plans we headed to Ooty instead. its our family tradition to go there atleast once every year. i usually have the same amount of fun as i always do when i go to ooty, the tea, the chocolates and the resort! but this time i was amazed to have so easily spotted these loveley plants/mosses! i grabbed as much as i could, not even knowing their names or how to keep them. i got them to my room and started researching as much as i could. i could only ID one as star moss and few others as terrestrial mosses. i loved their color and shapes and decided to make a terrarium. i contacted hobbyists and friends back in town to help me out and if they wanted some as well, so for the next two days i kept searching for what else i could find! sad part is i had very few packing material and wasn't able to pick up the most amazing of the plants, which was the giant indian fern. i choose not to disclose few of the locations where i got them, sorry. lastly i dedicate this project to my dad for taking me there as a birthday gift, and planning on calling it as "Sudha", which is the name of my granny who past away two and a half years ago and who also loved ooty! i'll let the pictures do the talking, i need your comments guys so i can improve it. no fauna as of now. (don't think any fauna would like such a small tank) would they? tank is covered with a plastic lid to trap moisture, seems to be doing its job for now, is there any better alternative? (i can't invest on a mist maker or such). 1. here's a full image of the tank as of now, lighting is just for the picture. 3. a close up of the fissidens, sorry for the bad pic quality, my phone is bad and i'm a bad photographer. 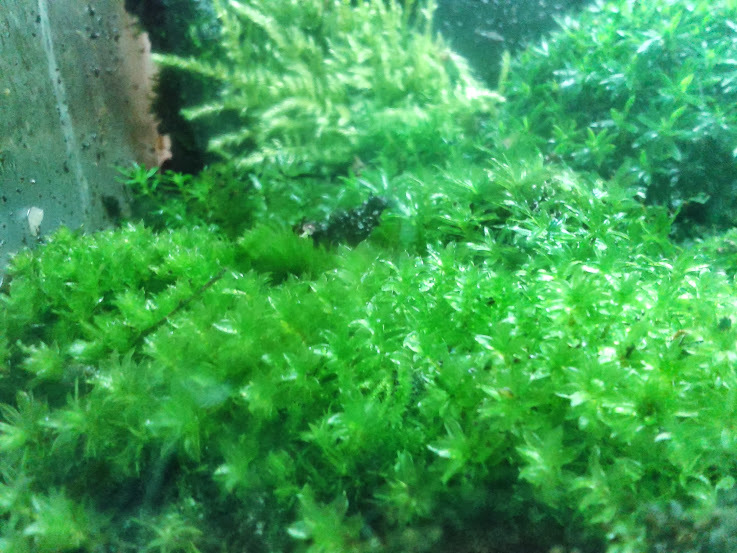 4. the most debated about, star moss whether it can survive under water or not. i just didn't want to risk it so i put them in this. 5. this moss/plant was most commonly found, though i don't know the name. it was almost impossible for me to take these out in proper mats, that too without any tools. 6. (top center) i just loved how that moss was growing. 7. the biotope where i found these plants. it looks amazing! 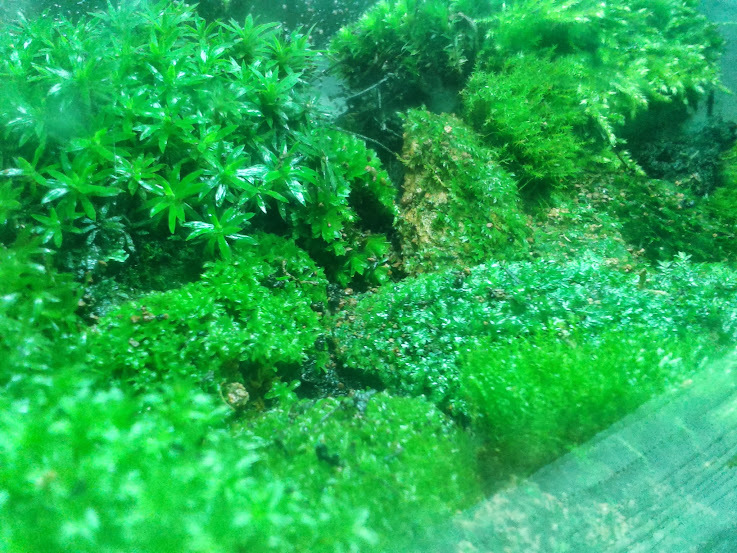 all these mosses looks really beautiful, i really envy your terrarium, all the best n keep up the good work. Can something like this be housed here? maybe for a few weeks, but long term: no. 1. Thats a froglet, which will grow. the tank size is too small. 2. The setup has to be closed, otherwise the forg (or any other animal) will get out. other things to be considered: Despite good ventilation, the moisture has to be maintained, e.g. by spraying several times a day. If you do so, you will have to provide a drainage, otherwise it will turn into a swamp. Try to maintain the moss over 2-3 months, this will give you a good feeling about moisture, temperature...then you can think about fauna. Thanks. The mosses have begun to grow and spread! Fauna I have all the patience. No problem. Nice collections.. But would like to say that most of the moss that you got would rarely grow under water. It would be really good if you adapt them to grow under water. I had tried this before and failed. 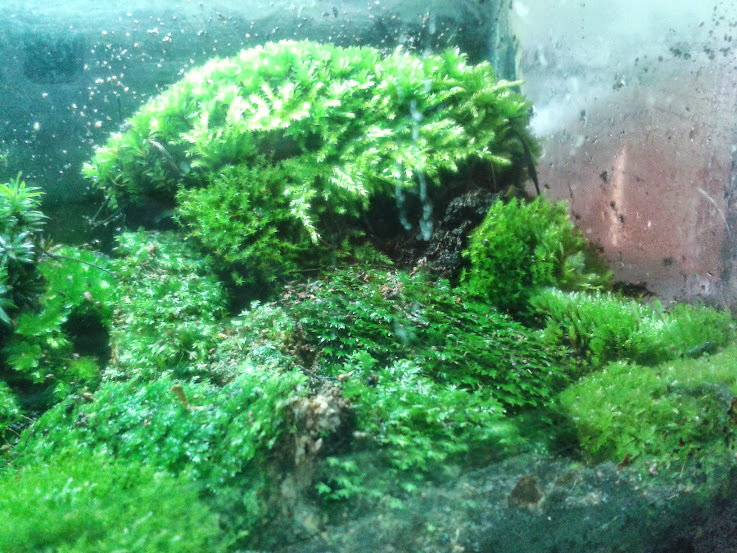 With-in a week, the entire mosses turned pitch black and died. You can find these kinds of Mosses on the way to Ooty (gudalur ooty road). 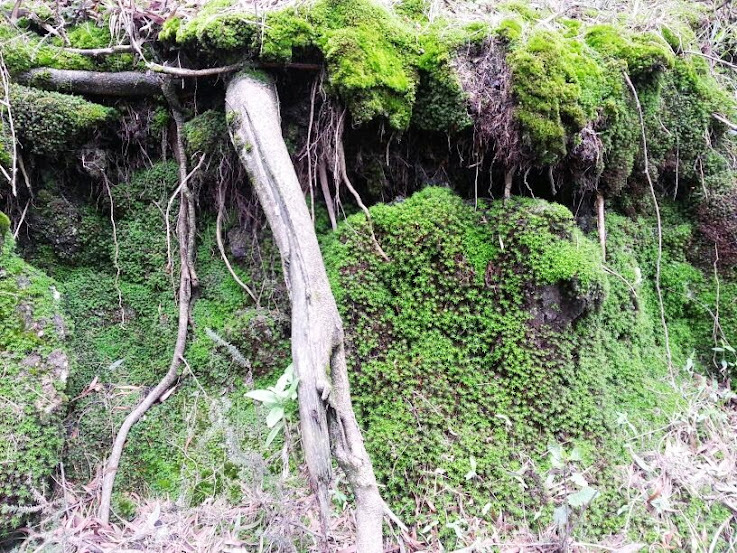 There are lots and lots of big trees covered by different kinds of moss. The entire trunk of the big tree is covered by the moss. I happen to hear from my Dad when he was working in Gudalur that Forest dept was planning to cut down all these trees as the moss is absorbing lots of water from the ground and it is severely affecting the ground water level. I am not sure if this fact is true. It is best to run it without any animal due to small size of tank. @shelly- yes few of these are in my shrimp tank with diy co2 and its been a week and they're alive and growing. The star moss for sure won't survive under water. I gave few hobbyists as well, yet to hear from them about their mosses. I don't know if that fact is true or not, I found few of these growing on trees, few on rocks and few on the soil itself. @Scorpio-my only priority now is to be able to grow these mosses. If I can do that, i'll set up a larger terrarium and add fauna. the terrarium has no issues, though i pulled out some centipedes, fly larvaes and caterpillers which seemed to have hitch-hiked. don't see much growth but they look more lively now. few weeds have grown here and there and i have to pull them out. I finally got the pics which i took on my camera, here are the close ups and biotope pics. doesn't this look like christmas moss? well it isn't but i'm glad to say that it grows in water! something which looks amazing i guess? this had a bit of pellia neesiana growing by the side, couldn't get a pic of it. ID'ying it would be good..
ID'ing it would be good..
i added some ID tags now, but the field of mosses is huge, its going to take me time for me to properly id all of it. google's a terrible at helping me out in this. Phew... huge collection. is it easy to maintain a terrarium?